White paper on crime 2001 Part 1/Chap.1/Sec.3/1. Fig. I-11 shows the trends in the number of persons newly received by public prosecutors offices for Income Tax Law violations, Inheritance Tax Law violations, Corporation Tax Law violations, and Consumption Tax Law violations over the last decade. Table I-9 shows the trends in the number of cases and the average amount of tax evasion per case charged from the National Tax Agency to the public prosecutors offices for each fiscal year in the last five years with respect to Income Tax Law violations, Inheritance Tax Law violations, Corporation Tax Law violations and Consumption Tax Law violations. 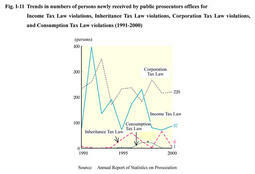 In FY 2000, the total number of charged cases of tax evasion was 146, and the average amount of tax evasion per case (including the amount of an additional tax) decreased over the previous year by 23.4% for Income Tax Law violations, 15.3% for Inheritance Tax Law violations, and 6.9% for Corporation Tax Law violations. There were 22 cases of tax evasion with the amount over ¥300 million and 5 cases with the amount over ¥500 million (Source:National Tax Agency). By type of business in FY 2000, the number of charged cases of tax evasion relating to the retail business was 25 (17.1%), which was the largest number, followed by the manufacturing business and the wholesale business, each of which had 15 cases reported (10.3%). By means or method, tax evasion was mainly committed by excluding part of sales (hiding part of earnings by failing to enter part of sales in a book) and reporting fictitious expenses (reporting more expenses than actually incurred using false receipts to reduce apparent income). Profits obtained through tax evasion (hidden assets as a method) were mostly retained in the form of deposits/savings, discount bonds, real estate and cash (Source:National Tax Agency). Table I-10 shows the trends in the number of persons prosecuted or not prosecuted by public prosecutors offices over the last five years for Income Tax Law violations, Inheritance Tax Law violations, Corporation Tax Law violations and Consumption Tax Law violations. Prosecution rates have remained over the 80% mark during the period. In 2000, all the persons prosecuted for the above tax law violations were brought to formal trials by courts, and no persons prosecuted received summary orders (court order of payment of fines based on documentary examination). According to the Annual Report of Judicial Statistics and data provided by the General Secretariat of the Supreme Court, the number of persons finally disposed by courts in the ordinary first instance in 2000 was 49 for Income Tax Law violations (42 were sentenced to imprisonment with labor for a fixed term, 5 were sentenced to fines, 1 was subject to dismissal of public prosecution, and 1 was found not-guilty), 10 for Inheritance Tax Law violations (all of them were sentenced to imprisonment with labor for a fixed term), 170 for Corporation Tax Law violations (74 were sentenced to imprisonment with labor for a fixed term, 91 were sentenced to fines and 5 were subject to dismissal of public prosecution), and none for Consumption Tax Law violations (see Appendix I-5 for the type of punishments on the persons sentenced to imprisonment with labor in the ordinary first instance during the period from 1996 to 2000).